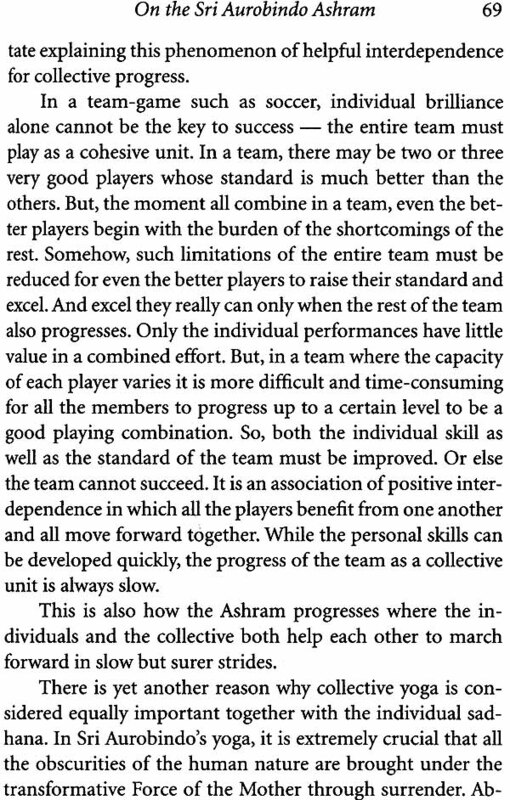 "Can a unique spritual oranizationthat is the Sri Aurobindo Ashram to becompared with any other endeavor or judged by any set standard? The attempt is bound to fail. For, the nature and the character of this ashram is far too complex for any proper evaluation by the human mind which has the innate inability of understanding or accepting anything that is truly spiritual in nature. It is not that the nature of work that is going on in this ashram is totally beyond comprehension. But, as with the case of an exclusive research in any specialized field - it has its own parameters, own methods for examination and understanding. Insight, inner feeling, intuitive knowledge, occult vision, spiritual experience are some such ways through which one canperceive the truths of the spiritual matters and nt necessarily only with the intellect or sense organs. There is no inconsistency in thisstatement. for, even in order to carry out any scientific research and discover its truth special tools other than the normal human capacities are obsolutely essential. can a research on microbiology be caried out without the help of a microscope? Or on astrophysics without a telescope? any Attemt of judging the true spiritual matters without the help of inner faculties will be as meaningless and futile as trying to study an electron or a planet through the naked eyes without the aid of specialized instruments." "For how long have you lived in the Ashram?" an aged visitor asked an aged inmate of the Ashram recently. Both had just come out of the main campus of the Ashram, crowded with curious tourists, scores of them. "Well, for a little over fifty years;' answered the inmate. "Do you get the same feeling inside the campus as you must have got during the early phase of your stay?" asked the visitor. Now the surprise was on the visitor's face. The inmate appreciated it. Fifty years ago Pondicherry, then Pondicherry, was a much quieter town. Hand-pulled or cycle-rickshaws were the means of human transport; neither the auto nor the taxi was in sight. The promenade along the sea wore a deserted look for the greater part of the day. The Ashram premises were a citadel of silence. Except for the Darshan days visitors were few. The inmate who had been questioned lived in the "other" Pondicherry, an inner Pondicherry that remained interspersed with the external and the obvious one. Many inmates as well as outsiders who visit with devotion have the same experience - an experience that is a clue to understanding the Yoga and the vision of Sri Aurobindo - the Yoga that does not shun the world; the vision that is focused on transforming man. But people confined to the conventional images of an Ashram and Yoga and not exposed to Sri Aurobindo may feel confused and at times that sort of confusion costs the Ashram a lot. This author remembers a visitor to the Ashram in the sixties of the last century who keenly followed a routine of a Sadhak named Ramkrishna Das for a full week. Ramkrishna-ji hailed from Odisha but since he was in his teens was pursuing a traditional system of Yoga, living in Ayodhya, gradually gaining popularity among seekers in that part of the country. This author personally knew some of his disciples which included a Raja and a Judge of the High Court. Call it a golden chance or a sanction from Providence, one day he suddenly realised who the Mother was. He quietly left his own establishment, reached Pondicherry and joined the Ashram. The aforesaid visitor observed that from early in the morning the old veteran followed a routine consisting of his paying obeisance at the Samadhi and then proceeding to the Dining Hall and, after his breakfast, sat absorbed in as ordinary a work as washing dishes for a couple of hours and then proceeding to a department of the Ashram that took care of Odia publications. He worked there till it was lunch time. Back at the Dining Hall he settled down once again to washing dishes and after a brief rest in his austere room, talked to visitors, wrote replies to letters and then reported at the Ashram Playground for physical exercise. He was then back at the Dining Room, worked for a while, and retired to his room, after attending a collective meditation only on two days a week. The visitor asked a friend of this author, surprise writ large on his face, "What about Ramkrishna ji's Yoga? When does he do it?" It must have proved tough for my friend to explain to him work was Yoga - work done as an offering to the Divine. No wonder that one who sees the inmates of the Ashram going without ochre garb or matted locks - not that there was anything wrong in that sort of tradition - should feel intrigued. One does not see them as practicing Asanas and Pranayama in a programmed way either. 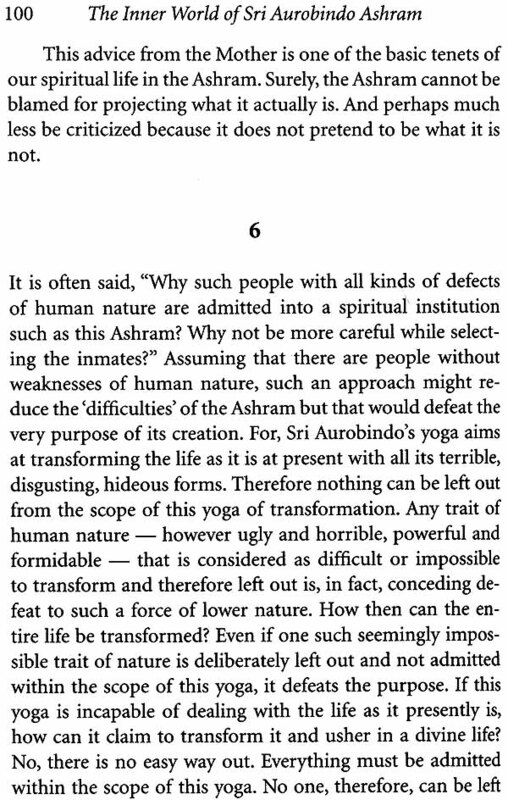 One could find oneself at a loss to identify Sri Aurobindo Ashram with the prevailing concepts of such institutions. One may further be baffled at the varied cultures, attitudes, moods and conducts of the inmates, unless one had realized that this is not a shelter for hermits and ascetics; it is a laboratory representing every kind of human nature, so that the transforming light invoked by Sri Aurobindo and the Mother could work on the totality of the human consciousness as it is in its present condition. 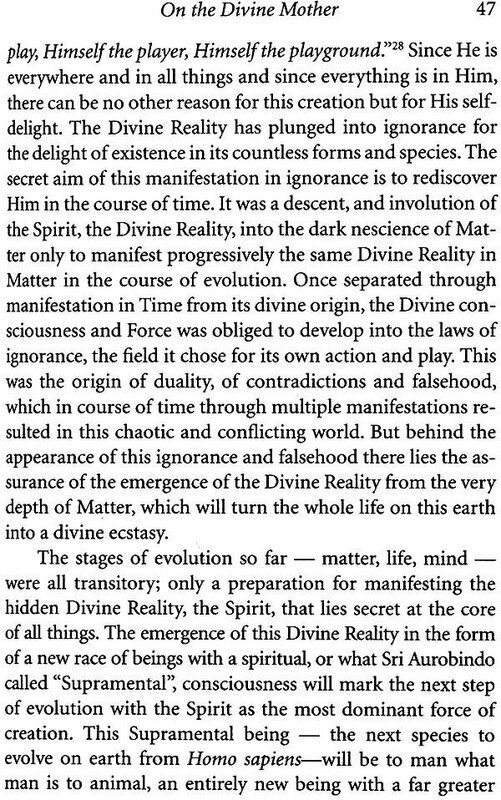 This work by Shri Kush Sen not only states the raison d'etre of this unusual Ashram and not only further explains the points touched above, but also presents luminous glimpses of the evolutionary as well as revolutionary vision of Sri Aurobindo about the future of man. With no recourse to pedantry, Sen presents his observations in a style that is at once lucid and highly readable. 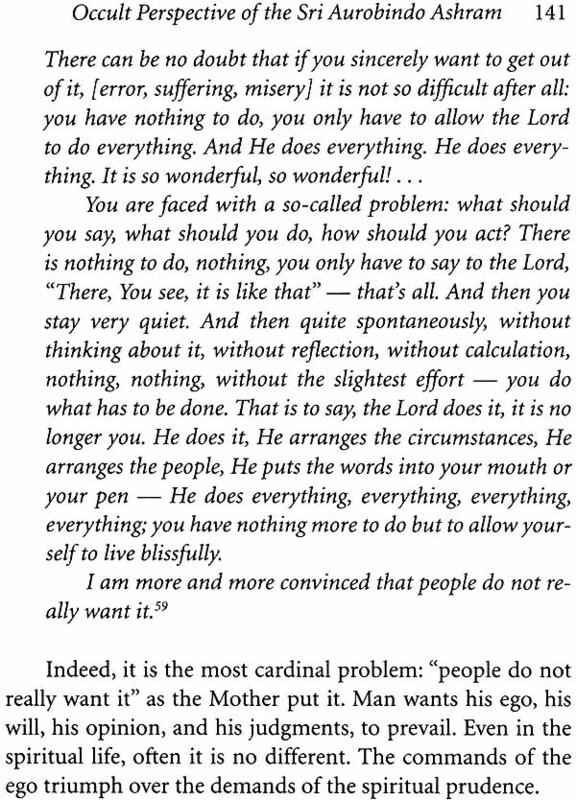 He does not assume the position of one who was imparting lessons; he shares his convictions with seekers. The faith that runs across his essays makes them vibrant with life. I am sure readers will find the work immensely helpful. Once in a discussion an atheist refused to accept the theory propounded by his scientist friend that the presence of a definite order in Nature implies that there was a Supreme Power behind the creation. "The presence of definite laws in Nature confirms that there is a Governing Power behind;' said the scientist. But the atheist would not agree. "It's all due to science;' he kept on arguing. The scientist remained quiet and invited him to visit his place. "What do you mean by 'nobody'? Someone must have made it." But again the scientist repeated: "1 just told you that no- body made it. It just materialized one day. It's science." The atheist was annoyed. He retorted: "Yes, I know what science is. But there cannot be any science behind the model materializing out of nowhere, as you say. It's most unscientific to even suggest such a prospect." The scientist quietly replied: "My dear friend, you refuse to accept that the actual universe has a Creator and attribute its materialization as an act of science. If this vast universe can emerge of its own out of nowhere, why not this small model? Nearly fifteen years back I took a leave of absence from my work at the Ashram; I wanted to make a film on the philosophy of Sri Aurobindo and needed time to exclusively work on this project. I structured a script and went ahead with the initial part of the film-making. This film, however, could not be completed due to various reasons. Naturally I was very disappointed. Looking back at the basic concept of my script almost after a decade and a half I feel relieved that my project did not come through at that time. 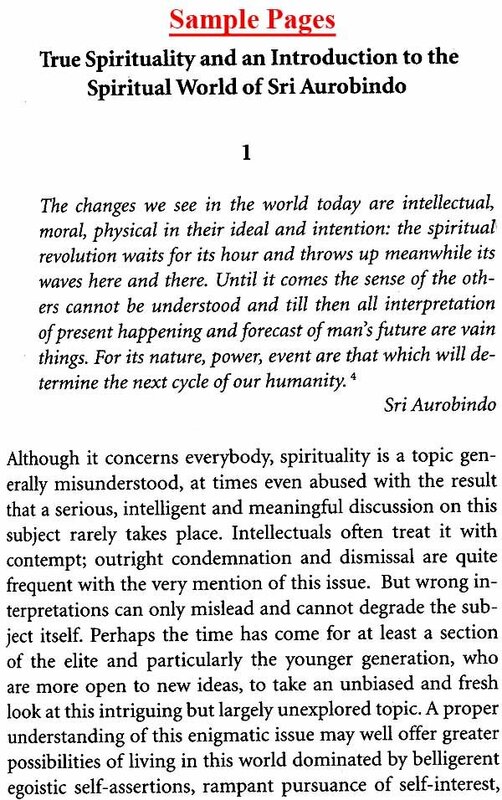 It would not have been made acceptably or understood properly, for I overlooked the crucial need of explaining a very fundamental issue: 'Spirituality'; which is absolutely imperative to comprehend before one can really begin to appreciate the vision of Sri Aurobindo. Subsequently I made amends and the present collection of my essays begins with an elaboration of this extremely important but largely misunderstood concept. In this collection, there are four sections each with two or more essays loosely grouped together according to the topic with a brief 'Introduction' preceding each section. Except for the first and the last ones which are more recent, the rest of the essays have been written over a period spanning more than twenty years but are being published for the first time as a book. However, the contents of four essays: "On Reading Sri Aurobindo", "The Sri Aurobindo Ashram", "The Concept of the Divine Mother", "The One whom we adore as the Mother", were published before as Editorials of SABDA Newsletter. Writing at different times on various aspects of Sri Aurobindo's philosophy and yoga as well as on the uniqueness of his Ashram certain basic and pivoting concepts and topics have been repeated in several essays. Although this may appear a bit repetitive but it can also be helpful to the uninitiated readers to understand the intricacies of the subjects. The spiritual world of Sri Aurobindo and the Mother is so unique, vast, profound and all-encompassing that it leaves one completely amazed. Writing on their visions and trying to explain their philosophy and yoga can be extremely tricky as perhaps it is impossible to fully fathom the many-sided, all-embracing, intensely insightful nature of their teachings, especially several totally new concepts introduced by them in the body of the spiritual knowledge. Any elucidation of their visions therefore can only be intrinsically inadequate. The essays in this collection do not make any claim to be the authentic representation of the views of Sri Aurobindo and the Mother. This collection would serve its purpose if it can act as an introduction and as a conduit to their original writings. It is also hoped that the inner significances of the Ashram life presented here would help to appreciate the value of this unique spiritual institution in the right perspective. Presupposition of a higher Reality while approaching spiritual matters is imperative. Hopefully, the 'Prologue' would act as an eye-opener. 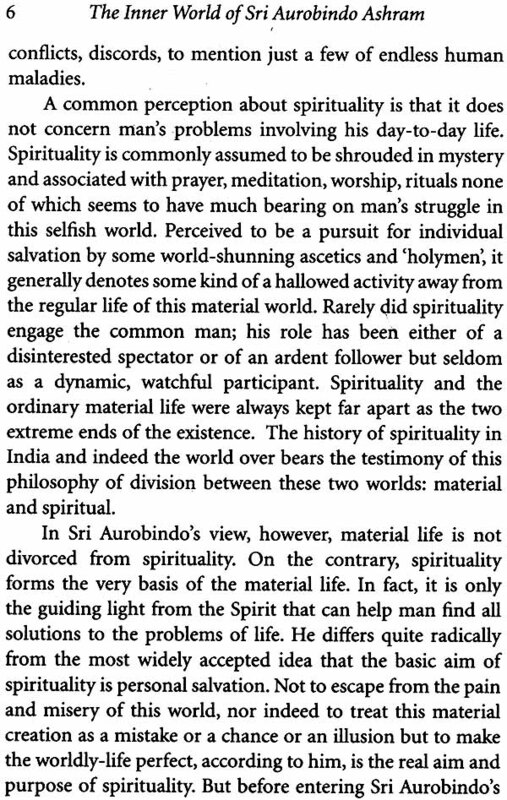 This section begins with an essay: "True Spirituality and an Introduction to the Spiritual World of Sri Aurobindo" It is important to understand 'spirituality' as defined by Sri Aurobindo, as it is quite a misunderstood term applied randomly to religious ceremonies, rituals as well as to many apparently noble deeds and even to all kinds of occult and paranormal activities, black magic, and other inexplicable phenomena. But in reality spirituality denotes actions originating from a higher level of spiritual consciousness. It is beyond the mental consciousness or Mind, which is the most evolved consciousness that presently dominates the earth. There is a vast difference between the popular conceptions and what true spirituality is, and the first part of the essay explains various aspects of this intriguing but largely misinterpreted concept. The later part of the essay explores the spiritual world of Sri Aurobindo and the Mother and hints at the treasures one can garner while traversing on their path. 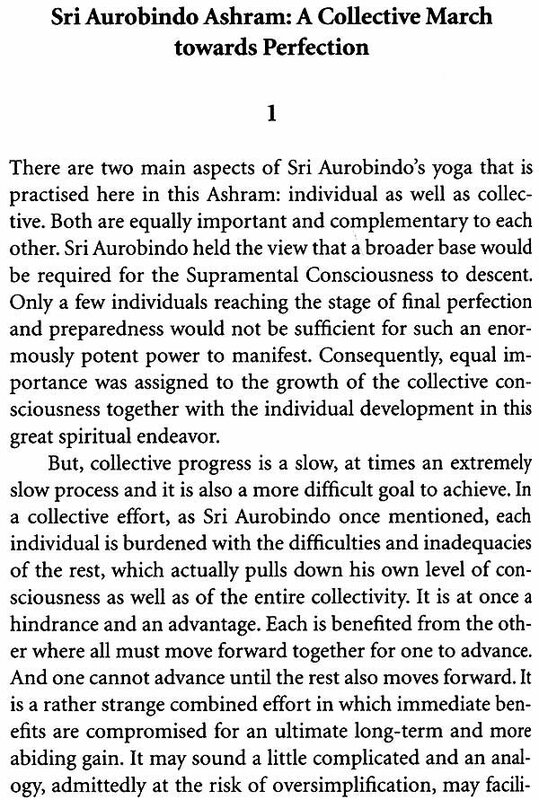 The second essay titled: "The Aim of Sri Aurobindo's Yoga" briefly discusses the true meaning of the term 'Yoga' and its real purpose. A legacy of the ancient Indian traditions, this term signifying profound disciplines for spiritual seeking has assumed a rather populist connotation in modern time. 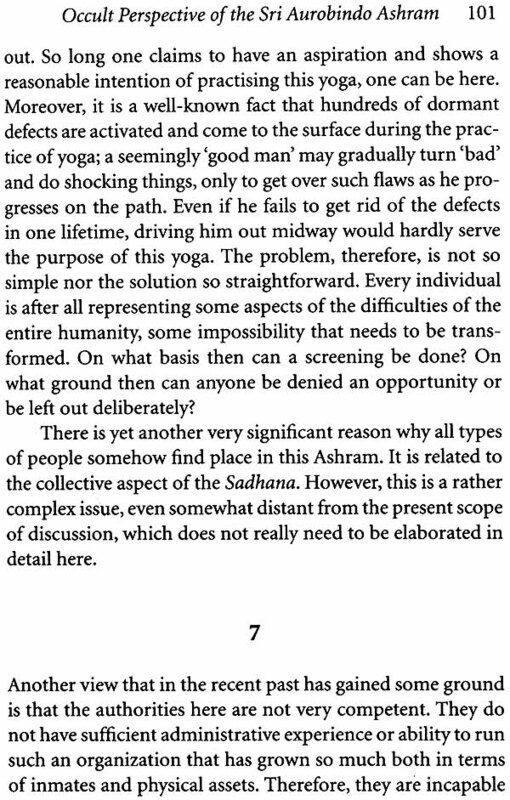 This essay tries to put this issue in the right perspective and also explains briefly the basic aim of Sri Aurobindo's yoga. 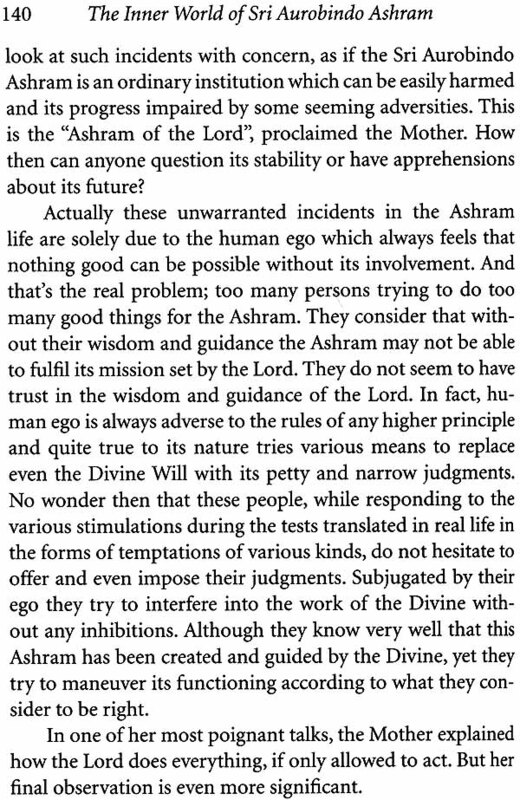 The next essay: "The First and the Last Word in Sri Aurobindo's Yoga" is an explanation of a very fundamental concept in Sri Aurobindo's yoga: 'Surrender'. The final essay of this section: "On Reading Sri Aurobindo" offers an insight into how to approach the writings of Sri Aurobindo.